For years now, I've dreamed of being able to work remotely without having to lug around my laptop and Cintiq. For a while, I'd been eyeing what seemed to be the top three options for a portable digital work station: the Cintiq Hybrid, the Cintiq Companion and the Surface Pro 3. Getting to try out one of the Wacom options proved to be impossible--I couldn't find one near me to test out. So one day I went to my local Best Buy to see if they had any Surface Pros on display. Luckily they did and I was very impressed! After a few days, my husband surprised me with one for my birthday and I was off to the races. Now that I've had it for a good four months, it's safe to say I love it! Compatibility Manga Studio 5 (my illustration preference) is perfectly compatible with this machine. It's interface is made for touchscreen units with the ability to rotate/scroll/pan with your fingertip (see video below). I have seamlessly worked back and forth between the Surface Pro 3 and my iMac/Cintiq using Dropbox to share my files. Also, the line quality and pen pressure in Manga Studio for my Surface Pro 3 is very close to what I get on the Cintiq. After some fooling around, I got the pen pressure on the Surface Pro 3 to match my desktop's Manga Studio pen pressure settings. Convenience It is super light and the battery lasts a good 6 hour work session without being plugged in. The plug itself is petite and not cumbersome at all. Plugging into an outlet at Starbucks is hassle-free. Ease of Use Being that I am an Apple person, the Microsoft interface was foreign, but only took a bit of exploring to get used to. Finding apps, saving documents and locating files is pretty straight forward. PALM REJECTION! 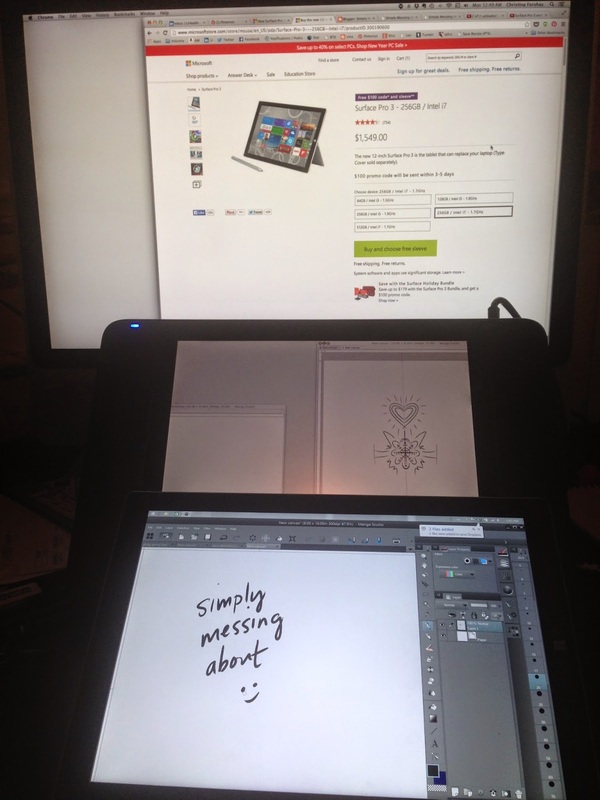 I have had no hiccups with the Surface Pro 3 rejecting the palm of my hand when I'm working. No stutters at all. This makes drawing on the Surface Pro 3 about a million times better than my experiences with trying to draw on an iPad. The Kickstand The kickstand on my Cintiq 12 only locks in to one angle which at times feels too low. The kickstand on the Surface Pro 3 is firm at any angle you want to set it and will not give in to pressure from my arm while drawing. The Screen The screen is WAY brighter and clearer than my Wacom Cintiq. The colors also match my desktop WAY better then my Cintiq ever has. Multitasking I can have one app open on the left hand of the screen and another open on the right simultaneously. It's nice to be able to see the manuscript I'm working on and Manga Studio open on the screen at the same time! Yes, like any other art tool, it will take a few hours to get used to. But overall, for me, the Surface Pro 3 is the perfect machine for working on the go for final illustrations and/or for sketching. It is snappy and may be faster and stronger than my Macbook pro (which is a few years old now). I've taken it everywhere and (knock on wood) it has been flawless. Brightness of my working screens: iMac (top), Cintiq 12 (middle), Surface Pro 3 (bottom). The SP3 wins! Any lag between stylus and screen? If so, it is teeny tiny. Rotating, panning, zooming using fingertip control. Lately I've been doing a lot of experimenting with actual paints and brushes, but for the past six or so years, I've been completing all my projects using Photoshop CS4. Over the years, I've figured out a system using Wacom's programmable ExpressKeys, Touch Strip and Radial Menu that helps me paint quickly and efficiently. Using these programmable keys along with a specific Photoshop window arrangement allows for faster painting...get those deadlines done! First things first, I'm working on a two or three year old iMac 23" and a Wacom Cintiq 12wx (the ExpressKeys are also available on the Wacom Intuos 3's, 4's and 5's too). 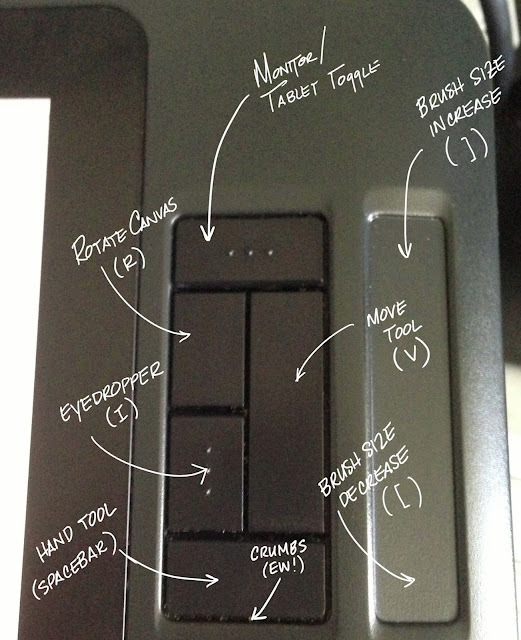 Below the video, I've included diagrams of how I've set my Wacom Cintiq's programmable options. Remember, the programmable keys come on the Intuos tablets as well, so if you don't have a Cintiq, all is not lost! 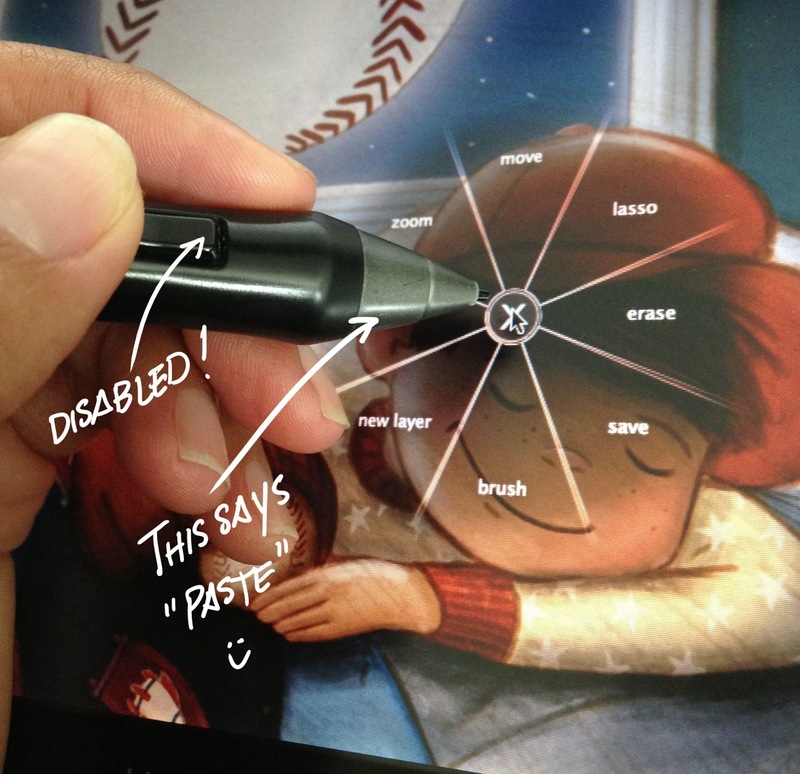 The Cintiq and Intuos tablets come with programmable keys located on both sides of the tablet. I've disabled the ExpressKeys on the left of my tablet being that I'm left-handed and it's just too much of an inconvenience to use while I'm trying to paint! There is a slight difference in how the keys are set up depending on how old your tablet is, and here is how mine are set up. The letters/symbols in parenthesis are the keyboard shortcuts I used to program the functions into the HotKeys in my Wacom preferences. The most thing for me here is to have a smaller version of my current painting file open so that I can see the image as a whole. To do this, go to 'Window' on the menu bar, drop down to 'Arrange' and then select 'New window for ....". Having this smaller window open is a huge help and is very similar to stepping away from your canvas or squinting so that you can see how your painting is coming together in terms of warms/cools, lights/darks, etc. I hope you enjoyed! By the way, I'm sure we'd all love to hear some cool tips and tricks that you've put into place regarding your tablet and Photoshop! Let us know your favorites!